We accept all major credit cards, including American Express, MasterCard, VISA, and Discover. Currently, we ship to California addresses only. After your order is placed, we will follow up by phone to confirm the order details, including delivery address and optional installation. 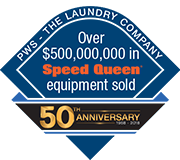 PWS does not accept returns on equipment. All equipment is covered by the manufacturer warranty. New equipment is covered by Alliance's manufacturer warranty.